Made of water repellent nylon. 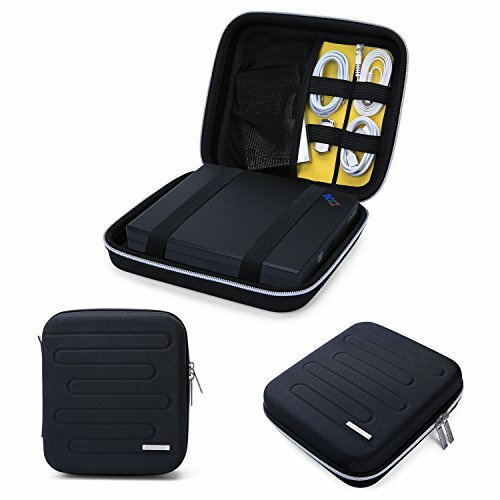 Two-way zippers allows convenient access to your travel accessories. Shockproof padded cushions inside shock absorbing. Slip resistant elastic loops secure your external DVD drives in place, protecting your devices from scratches, bounce around and accidental dropping. 1 mesh pocket and 4 elastic loops provide best flexibility for organizing USB cables, earphones, power bank and other accessories. Thoughtfully designed interior yellow velvet fabric make the case more stylish, and you can easily and efficiently find you items.